Casino Big Apple is your ticket to a great win! Create an account and you’ll immediately receive 10 No Deposit Spins as a token of appreciation. 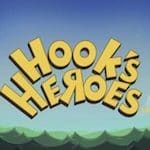 The extra rounds work perfectly on Hook’s Heroes slot game by using the promo code HOOK5. Wager the bonus amount 50 times before withdrawing your funds. You can’t cash out more than £20. This is your chance to claim a great prize!